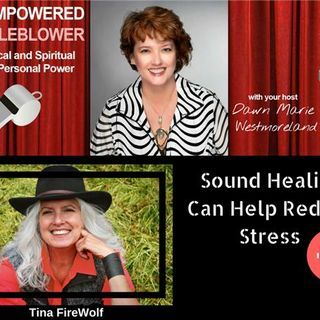 As an Author, Singer, and Facilitator of Remembering, Tina FireWolf - “The Cosmic Farm Girl” - is cultivating sustainable inner peace, and causing a “Remembering.” She combines her cosmic gifts, background in Science, Leadership & Education, and her multi-tonal vocalizations to accelerate and simplify personal development. Tina is dedicated to joyfully stopping us all, including herself, from “seeking outside of ourselves” whether in business or daily life. She shares a light-hearted ... See More approach to the HOW of Self Leadership & Personal Healing by empowering people with real world skills for powerfully peaceful communication and productivity. People who learn her Experiential Self Leadership Method (ESLM) uncover their unique sound and sing themselves into Sustainable Inner Peace. Purchase her book Beneath the Chatter: the wise self awaits or her new CD “Medicine Within – Vocalizations to Free Your Soul.” You can connect with Tina at TinaFireWolf.com.